"What's the time?'' asked Aldrin from Columbia's right-hand couch. The crew of Apollo 11 had made their attitude checks prior to TEI, and were checking that the engine bell was swivelling on its gimbal correctly in response to steering commands. Preparations were going smoothly and there was a light mood in the cabin as their incredible flight began to look as if it might actually come off. "Check," concurred Aldrin. Since they needed the spacecraft's high-gain antenna to face Earth and it was positioned on the opposite side from their windows, it made sense to point down and watch the receding Moon. "Okay, 10 minutes until Tig,'' called Armstrong. 'Tig' was the 'Time of ignition' and everything they did worked towards it being on time and as flawless as possible. As they were over the far side of the Moon, where it also happened to be lunar night, neither the Sun nor Earth was shining across the landscape, and the only way to see the Moon's position was by looking at a huge void where there were no stars. The spacecraft had to be travelling with its pointed-end forward if the engine at the rear was to accelerate them out of lunar orbit, and Collins was straining at the window for some kind of confirmation of this fact. "I see a horizon," he laughed. "It looks like we are going forward." "Shades of Gemini," reminded Armstrong. "It is most important that we be going forward," stated Collins. Aldrin began gently mocking his crewmate. "Let's see. The motors point this way and the gases escape that way, therefore imparting a thrust that-a-way." They all laughed. This was a chance to pause and reflect during their preparations, and to look for the horizon that they were supposed to check in a few minutes. Collins and Aldrin could see directly forward through their rendezvous windows along the plus-x axis and towards the sunrise. Armstrong's view from the middle couch was limited to the hatch window just above his head. The crew returned to the strict protocols of challenge and response, with Armstrong reading out a line from the checklist and Collins repeating it once he had carried out the instruction. Once they had dealt with the internal configuration of the spacecraft it was time for another external check. "Two minutes to get our horizon check at 10 degrees.'' Armstrong had little option but to have his head in the checklist. "I hope so,'' said Armstrong. "Beautiful," agreed Collins, who armed one of the engine's control banks then proceeded with Armstrong through the final lines of the checklist. "Okay, stand by for 35 seconds,'' announced Collins. "Mark it. DSKY blanks; EMS is in Normal.'' The guidance system had begun to measure their acceleration. ''Coming up on 15 seconds,'' said Collins. ''Got the ullage,'' reported Aldrin. Two rearward-facing thrusters lit up, gently pushing the spacecraft forward and bringing the weightless propellant to the bottom of the tanks as the crew counted down. ''Burn!'' shouted Collins as the SPS engine lit. ''A good one. Nice.'' ''I got two balls,'' called Aldrin. Only two of the four ball valves on the propellant feed lines had been opened by the computer. Opening all four would bring the engine to its maximum thrust. When they had fired the SPS engine on arrival at the Moon, the tanks in the service module had been full and a fully fuelled LM was attached to their nose. Now the CSM was by itself and its tanks were only one-third full, giving the SPS the ability to accelerate the spacecraft towards 1 g.
Collins was closely monitoring the displays in front of him. ''Pressures are good. Busy in steering, but it's holding right in there.'' ''How is it, Mike?'' asked Aldrin from the right. ''It's really busy in roll,'' replied Collins, ''but it's holding in its dead band. Looks like it's holding instead of plus or minus 5, more like plus or minus 8 [degrees]. It's possible that we have a roll-thruster problem, but if we have, it's taking it out. No point in worrying about it. Okay, coming up on 1 minute. Mark it, 1 minute. Chamber pressure's holding right on 100 psi.'' ''Looks good,'' agreed Aldrin. 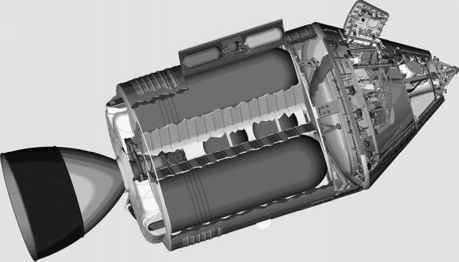 There was no problem with the roll thruster, but the sloshing propellant could have a significant effect on the spacecraft's attitude which was corrected by the thrusters and the engine gimbals. ''Two minutes. Mark it,'' continued Collins. ''When it hits the end of that roll dead band, it really comes crisply back.'' Collins was describing how well the computer was able to deal with the CSM's tendency to drift off in attitude. The 2 minutes 28 seconds that mission control had predicted for the burn came and went, but the engine was still firing. ''It should be shut down now,'' said Armstrong. Collins stopped the engine at the same time as the computer. It had burned for 3.4 seconds longer than predicted because its thrust during the LOI burn had been slightly high and mission control had used that data when planning TEI. In the event, a slight change in mixture ratio lowered the thrust, making it burn longer to achieve the same change in velocity. ''Let's look at what we got,'' said Collins as they brought up the residual velocity components. ''Beautiful,'' he commented, ''x and z, 0.2.'' A burn that had changed their velocity by 1,000 metres per second was showing an error of only 6 centimetres per second. As with the LOI burn, no one knew anything of this in the MOCR or anywhere else on planet Earth. Any communication with Columbia was blocked by a 3,476-kilometre ball of rock. What they did know in mission control, down to the second, were the times when the CSM would come back into view if the burn had worked, and if it had not. The increase in velocity would dramatically shorten how long it was out of sight.